We set out below the headings of the main new features, followed by a detailed description of what customers can expect all as published by Land Rover. The Evoque’s bold exterior features interpretations of classic Range Rover design cues, including the signature clamshell bonnet, the floating roof and the solid ‘wheel-at-each-corner’ stance. The dynamic design is accentuated by its dramatic rising beltline, muscular shoulder running the length of the car, and distinctive taper to the floating roofline. The bold design graphic created by the exaggerated wedge of the window line is emphasised by the black pillars. Pushing the wheels out to the four corners gives the car its purposeful stance; the wheel arches are wide, but softly integrated into the body. The carefully sculpted corners dramatically reduce the car’s visual overhangs front and rear. The front-end design makes a powerful statement of Range Rover’s identity with the bold horizontal graphic and distinctive headlamps. The stylish body exudes a strong sense of luxury quality with its precise and striking details such as the bonnet and side vents. The Range Rover Evoque is available with LED-adaptive headlamps providing a jewel-like quality to the slim front and rear lamps with their LED signature lighting and tapering blade indicator clusters. Available in coupé, five-door and convertible body styles, Evoque’s bold and progressive design reaffirms its class-leading status. The front bumper has a muscular appearance dominated by the large lower air intakes. These include slimline LED fog lamps, positioned at the top of the intake, finished in Narvik Black for a striking stealth-like appearance. This attention-to-detail extends throughout, the air intake above the front number plate is contoured to echo the design. Two grille designs are offered, available in three premium finishes, which integrate seamlessly with the recognisable LED headlamp graphic. The standard grille is distinguished by two bold horizontal bars, while a geometric hexagonal design is available on HSE Dynamic models upwards. The tailgate spoiler and high-level LED stoplight enhances the dynamic look and enhances visibility to following vehicles. Additionally, roof fins added for vehicles specified with Wi-Fi hotspot feature an integrated 4G antenna, ensuring optimum signal strength and internet access speed for up to eight users. To give customers clearer choice, the colour palette has been amended to 11 options. The Core palette features: Fuji White, Narvik Black, Yulong White, Indus Silver, Corris Grey and Santorini Black; Flex palette includes: Loire Blue, Firenze Red and Kaikoura Stone; and Premium palette options are: Silicon Silver and Carpathian Grey. Evoque Convertible is also available in these colours and, unique to the bodystyle, Phoenix Orange. Enhancing Evoque’s dramatic road presence still further, HSE Dynamic derivatives can be specified with the Black Pack, which includes bonnet and tailgate lettering in Narvik Black, new black Xenon or full LED head, tail and fog lights, and eye-catching 20-inch alloy wheels. The front and rear tow-eye surround is painted in Narvik Black with the exhaust completing the visual upgrade in a dynamic black finish. A comprehensive range of 17- to 20-inch alloy wheels are available, with the choice of Dynamic or standard body kit. Together with three body styles and 11 exterior colours, Evoque customers can create their perfect, personalised vehicle. At 2019 model year, the Landmark special edition Evoque receives Land Rover’s Si4 240HP engine and the colour range is extended to include Firenze Red, Indus Silver and Santorini Black. The Range Rover Evoque was the first Jaguar Land Rover product to offer full-LED adaptive headlamps, offering a brighter, more evenly distributed light cone, a longer lifespan and reduced demands on the vehicle’s electrical system. The headlamps’ adaptive function enables light beams to be automatically aligned with steering inputs and follow the curves in the road, for more precise and greater illumination of the road ahead. Full-LED adaptive headlamps allowed the highly-dynamic rectilinear graphic that encompasses both headlamps and indicator functions. LED technology continues to be employed for Evoque’s distinctive daytime-running lights (DRLs), which integrate with both full-LED and traditional projector headlamps. The vehicle’s LED tail lamps harmoniously echo the full-LED headlamps’ eye-catching new graphic, with the bold geometric motif to underline Evoque’s confident and contemporary exterior design. The tail lamps also feature DRL technology with an integrated indicator function. The distinctive cabin is defined by premium quality materials, clean surface treatments, and the bold intersection between the solid horizontal elements of the instrument panel and the powerful vertical lines of the centre console. The central focus is the 10-inch infotainment touchscreen, featuring Touch Pro technology. Luxurious front and rear seats retain Evoque’s outstanding levels of comfort and support while also delivering a sporty, technical aesthetic to perfectly complement the progressive exterior design language. A portfolio of two distinctive seat designs, each with three different materials, is available with four increasingly sophisticated levels of adjustment. This ranges from six-way manual adjustment for both driver and passenger, to luxurious 14-way electric memory seats with four-way lumbar support and fully adjustable bolsters. Bringing large-car luxury to the most compact Land Rover, Evoque was the first vehicle in its class to offer massage front seats for additional comfort and a truly luxurious experience. Massage seats can be specified in conjunction with cooled 14-way electric memory seats, which are available from HSE specification. A selection of five massage programmes can be selected, controlled via the central touchscreen, providing various levels of back stimulation and helping to reduce driver fatigue. Interior door casings in both the front and rear of the vehicle echo the striking seat design, with a clean, contemporary feel; the armrests have a lean, taut appearance, with sharp contour lines and extra feature stitch lines adding crisp definition. Meanwhile, soft-touch, deeply-padded luxurious surfaces maximise the door casing’s exceptional tactility. A selection of 13 contemporary interior colourways is available. All derivatives feature satin-brushed aluminium trim inserts to highlight the strong horizontal instrument panel and the dramatic fast rake of the centre console; the most dynamic derivatives are differentiated by premium textured aluminium inserts for an even more striking appearance. Range Rover Evoque Convertible also comes with the choice of Lunar/Ivory interior (on SE Dynamic models) in addition to the Ebony interior. The Evoque’s interior is enhanced by a portfolio of ambient lighting packages. In high-series derivatives, this culminates in customer configurable 18-shade interior mood lighting that includes Ultra Violet, Amberglow and Racing Red. Lighting coverage throughout the cabin comes courtesy of full-length lighting under all armrests and door stowage areas front and rear. Drivers simply tailor the lighting to their own preferences via the touchscreen. A stealth mode is available to reduce cabin illumination to a minimum, if desired. SE offers grained Taurus leather seats with eight-way electric adjustment for both the driver and front passenger in a selection of Ebony Black, Almond/Espresso and Lunar/Cirrus colourways, while 12-way electric memory seats are offered as optional equipment. Distinctive 18-inch alloy wheels are fitted as standard. SE Tech introduces perforated grained leather seats, while 12-way electric memory seats are included for both front occupants. InControl Touch Navigation comes in as standard on SE Tech. HSE Dynamic adds a unique ribbed design of Oxford leather seat, Dark sport textured trim inserts and illuminated RANGE ROVER treadplates. A Dynamic body kit and 20-inch alloy wheels are included in the comprehensive specification. InControl Touch Pro navigation and 10.2” touchscreen also come in at HSE Dynamic. HSE Dynamic Lux features the 825W Meridian sound system with surround sound, 10.2” dual-view touchscreen, Digital TV, Keyless Entry, Park Assist and 360 parking aid, surround camera system with towing assist and blind spot monitor as standard. SE Dynamic specification includes 19” alloy wheels and Dynamic body style. Inside, customers receive heated perforated Grained leather seats as standard. Technology includes; 10.2” touchscreen, Incontrol Touch Pro Navigation and Meridian 380W sound system, rear-view camera, cruise control, front and rear parking aid, lane departure warning and pop-up rollover hoops. HSE Dynamic models receive 12-way powered front seats with perforated Windsor leather finish, rear-view camera and 20” alloy wheels. HSE Dynamic Lux adds windbreak, InControl Touch Pro 660W Meridian sound system with surround sound, Keyless Entry, Park Assist and 360 parking aid, surround camera system with towing assist and blind spot monitor, Reverse traffic detection, Land Keep Assist, and Traffic sign recognition as standard. A choice of three compact and lightweight four-cylinder Ingenium engines are available. One petrol engine, in two outputs, and two diesel, in three outputs, complete the powertrain line-up. All five derivatives meet stringent EU6 emissions regulations. Designed in-house by Land Rover and produced at the company’s £500 million Engine Manufacturing Centre in the West Midlands, UK, the Ingenium 2.0-litre turbodiesel engines are the most economical Land Rover diesel engines. An entirely clean-sheet design, all Ingenium engines are based around a deep-skirt aluminium cylinder block featuring thin-wall, press-fit cast-iron liners for optimum weight, surface finish and robustness. Fuel is fed to the combustion chambers by an efficient 1,800bar solenoid common-rail system, providing precision injection with low noise and excellent mixture formation characteristics. Variable geometry turbochargers create a rapid build-up of torque from very low revs, with maximum torque spread over a wide rev range for instantaneous response and strong acceleration on demand. EU6 emissions compliance has been achieved utilising a range of technologies to ensure outstanding environmental sustainability. These include variable exhaust-valve timing, which enables rapid catalyst heating and robust particulate filter generation. Selective catalytic reduction and cooled low-pressure exhaust gas recirculation also help to cut NOx emissions. Internal friction is 17% less compared with the previous-generation turbodiesel engine, boosting efficiency, smoothness and responsiveness. Advanced friction-reducing technologies include roller bearings on cam and balancer shafts, a simplified cam-drive system, variable-flow oil and water pumps, electronically controlled piston-cooling jets, and an offset crankshaft. Land Rover engineers have paid particular attention to reducing weight while maintaining excellent strength and high levels of refinement. Replacing the previously used iron block, the all-aluminium Ingenium engines are 20-30kg lighter, and stiff cylinder blocks and twin balancer shafts ensure inherently low levels of vibration. Decoupled injectors and 0.5mm ovality on the injection-pump drive-sprocket also contribute to the Ingenium engine’s exceptional quietness. Not only are the new Ingenium engines substantially lighter and more refined than previous engines, they’re also more affordable and convenient to own thanks to servicing intervals extended from 16,000 to 21,000** miles on all-wheel drive models, with no impact on longevity. Longer servicing intervals have been achieved by introducing several innovations, including a low-friction piston/bore interface that reduces oil consumption, the use of a very high quality oil featuring state-of-the-art additive packages, and a filtration system that benefits from a significantly cleaner combustion process. Crucially, Evoque’s reduced fuel consumption minimises combustion gasses and therefore the number of small particles that the filtration system must remove from the oil, while improved bore technology also reduces possible contaminates from each cylinder. As a result, the oil filter – and therefore the oil – stays significantly cleaner for longer. A new Diesel-Exhaust Fluid (DEF) AdBlue™ after-treatment system further enhances environmental sustainability. The system sprays an aqueous urea DEF solution into the exhaust system, neutralising harmful gasses such as nitrogen oxide emissions. Selective catalytic reduction and cooled low-pressure exhaust gas recirculation also cut NOx emissions. The 2019 model year Range Rover Evoque also receives Jaguar Land Rover’s new 2.0-litre four-cylinder Ingenium petrol engines for the first time. Technologies including an integrated exhaust manifold, 200bar direct injection system and twin-scroll turbocharger are key to the engines’ responsiveness and efficiency. The engines feature electrohydraulic control of the inlet valves. This cutting-edge technology enables variable valve lift, so load control is managed primarily by the intake valves rather than the throttle. This reduces pumping losses and provides unmatched flexibility and control over airflow into the combustion chambers, improving power and torque, increasing fuel efficiency and reducing emissions. As part of the continual enhancement of all vehicle lines, all Discovery Sport powertrains are now equipped with particulate filters to make them even cleaner. The efficient, close-coupled filters are neatly integrated into the aftertreatment system and trap ultrafines as the exhaust gas passes through them. Under normal driving conditions, the trapped ultrafines will be oxidised into CO2 and the filter regenerated whenever the driver lifts off the accelerator. All Ingenium engines are available with two and four-wheel drive and a choice of state-of-the-art nine-speed automatic or six-speed manual transmissions. 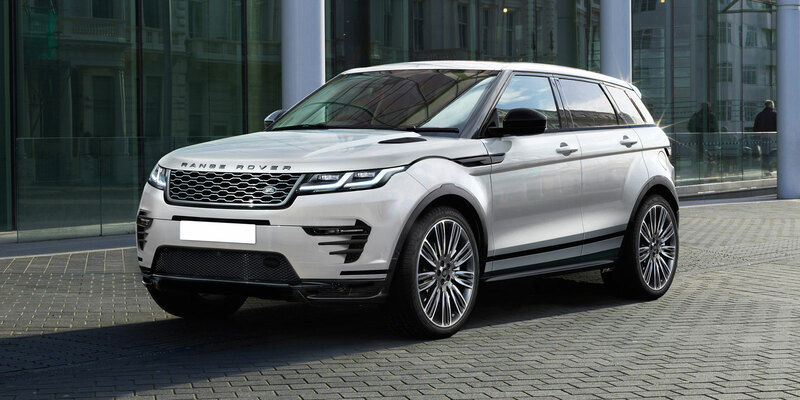 The Range Rover Evoque is based on Jaguar Land Rover’s smallest architecture and suspension system which have been developed to deliver outstanding dynamics both on- and off-road. The exceptionally strong, lightweight monocoque body structure has been developed to deliver outstanding stiffness and refinement together with excellent crash cell performance. The structure was optimised using the latest computer multi-dimensional simulation tools, and uses up to 18 per cent special high-strength and Boron ultra-high-strength steels in strategic load-bearing areas, including the A- and B-pillars and the sills. Mounted to this stable structure, the Range Rover Evoque’s fully independent suspension system features coil sprung struts front and rear together with isolated front and rear subframes. Evoque’s blend of compliant suspension, rewarding handling and responsive electric power-assisted steering (EPAS) system makes it an involving and incredibly comfortable vehicle to drive. This peerless duality has been achieved with the latest front suspension subframe and rear suspension bushings fitted, for maximum effectiveness in all conditions. Range Rover Evoque continues to be offered with a choice of three drivetrains: entry-level two-wheel drive, Standard Driveline four-wheel drive, and Active Driveline, a revolutionary on-demand driveline technology. Active Driveline can intelligently switch between two- and four-wheel drive in just 350milliseconds as conditions dictate, reducing driveline friction in two-wheel-drive mode to increase efficiency. Active Driveline enhances on and off-road capability further thanks to Torque Vectoring, controlled by a pair of electronically-controlled clutches located either side of the rear differential. The clutches quickly distribute torque to the rear wheel with superior grip, improving traction in low-grip off-road situations as well as increasing driver engagement on the road. The Evoque protects occupants using the strong and stable safety cell, which is complemented by a comprehensive system of airbags and restraints. The occupant safety package includes a carefully-optimised restraint system including driver and passenger, knee, and side curtain and thorax airbags. The Range Rover Evoque has always been as outstanding to drive off-road as on it, with class-leading approach (25 degrees), breakover (22 degrees), and departure (33 degrees) angles (all standard body kit), a wading depth of 500mm, and a suite of advanced all-terrain technologies. Whatever the weather, Evoque continues to deliver the all-terrain capability that is a hallmark of the Land Rover brand, making use of a unique suite of technologies to maximise performance and safety in challenging on- and off-road conditions. The primary technology is Terrain Response, which adapts the responses of the vehicle’s engine, gearbox, centre coupling and braking/stability systems to match the demands of the terrain, optimising driveability and comfort as well as maximising traction. The Range Rover Evoque has four Terrain Response settings, selected via a control on the centre console: General Driving (on-road and easy off-road); Grass/Gravel/Snow (slippery conditions, on- and off-road); Mud and Ruts; and Sand. An additional Dynamic setting is available for cars specified with Adaptive Dynamics. All-Terrain Progress Control (ATPC) enhances Evoque’s highly-accomplished four-wheel-drive chassis with signature Terrain Response® technology. ATPC allows a very low speed – lower than the natural creep speed of the vehicle, if desired – to be automatically maintained in challenging off-road environments where steep gradients, rough terrain and low-grip levels make continuing an ideal speed difficult. ATPC can be initiated either from rest or on the move, with no pedal inputs necessary other than releasing the brake pedal if the vehicle is stationary. The driver simply enables or disables ATPC via a switch on the centre console and inputs the desired speed via the cruise-control function’s steering-wheel-mounted controls. The driver can then focus on simply steering the vehicle, although accelerator and brake inputs will over-ride the system if required. Operational in forward and reverse gears from 1.1mph to 19mph (1.8km/h to 30km/h), ATPC reduces driver workload to ensure Land Rover’s world-renowned off-road capability is more accessible than ever before. Every Evoque can wade through water to a depth of 500mm, an invaluable benefit in off-road situations and when roads are flooded. Relaying information from sensors in the door mirrors, the Wade Sensing™ feature informs the driver of the water depth with a visual display on the vehicle’s 10-inch touchscreen and an audible tone that increases as the depth rises. The driver can see both the current depth of the water along with how much deeper the car can safely wade. A suite of advanced infotainment and driver-assistance systems keep Evoque at the cutting-edge of technological innovation. The Touch Pro infotainment system optimises in-car connectivity by providing fast responses and intuitive operation. Introduced from launch on the Range Rover Evoque Convertible, it is available as an option on the five-door derivative. The enhanced set-up is delivered via a high-definition, capacitive 10-inch touchscreen. The touchscreen functions like a smartphone, the home screen can be customised: wallpaper can be set to any image, and widgets can be added to provide shortcuts to favourite features. It’s even possible to add extra home screens. And the touchscreen accepts the ‘pinch to zoom’ gestures familiar to all smartphone users, all displayed in the clear 21:9 super-wide format with 1280×542 pixel resolution. Satellite navigation benefits from dead-reckoning functionality that accurately positions the vehicle even when GPS signals can no longer be received. Utilising a data connection enables even greater functionality and location-based features. Even before the journey starts, customers can choose their route and send it to their vehicle from their smartphone thanks to InControl Connect Pro. Evoque offers door-to-door route planning and guidance incorporating public transport options. Commute Mode learns your daily drive so that it can automatically offer alternative routes to avoid congestion using real-time traffic information, and Arrival Mode shows a 360-degree interactive view of your destination when you’re 200m away, as well as suggesting the nearest available car parking spaces. Users can swipe to two further screens, providing access to a wider range of features, including Wi-Fi hotspot, parking cameras, Eco Data, Wade Sensing and rear-seat climate-control settings. Voice Recognition and SMS text functionality is also combined with the satellite-navigation system. This enables one-shot voice destination entry and allows the customer to make a phone call or select a radio station simply by voice command. A premium 11-speaker Meridian sound system is standard, with the option to upgrade to a 17-speaker, 825w surround-sound stereo system. This top-of-the-range audio system includes a subwoofer and amplifier that incorporates modern digital processing technology for the ultimate in sound quality. Both sound systems are tailored specifically to complement Evoque’s unique interior acoustics. Touch Pro also brings rear-seat entertainment capability with eight-inch video screens and digital wireless headphones. The original InControl Touch system is available as standard, displayed through an eight-inch touchscreen flanked by hard buttons. InControl Apps can be specified with both infotainment systems, as part of the optional InControl Connect Plus Pack, and allows the user to connect an Apple or Android smartphone to the vehicle’s dedicated USB port and access well known apps optimised for in-car use via the touchscreen. The Range Rover Evoque Convertible is the world’s first luxury compact SUV convertible and the first ever convertible production Range Rover. Positioned at the pinnacle of the Evoque portfolio, the convertible broadens the desirability of the Evoque family further, taking the Land Rover brand to a new audience of customers looking for a unique combination of roof-down luxury and refinement. Land Rover’s design and engineering teams carefully evaluated all possible convertible roof systems before opting for a sophisticated Z-fold fabric roof from Webasto. Featuring tension bow architecture to complement Evoque’s crisply defined proportions, a flush-fitting heated glass rear window complements the luxurious acoustic insulation for maximum refinement. Evoque Convertible’s roof system lowers in just 18 seconds and raises in 21 seconds when the concealed roof button in the centre console is pressed. It also allows all four windows to be simultaneously raised or lowered for maximum convenience. Advantages of the five-layer polyacrylic roof design when compared with folding hardtop solutions include reduced weight and improved centre of gravity, and the ability to raise or lower the roof at speeds of up to 30mph (48km/h). Evoque Convertible’s spacious 251-litre luggage capacity is retained, whether the roof is open or closed. The Range Rover Evoque Convertible features a spacious and contemporary four-seat interior defined by luxury materials and soft-touch surfaces. The strikingly minimalist dashboard architecture juxtaposes the bold horizontal sweep of the instrument panel with the dynamic vertical rake of the centre console. All Evoque Convertible models feature fixed twin rear seats, with a central bolster, and revised quarter trim speakers. The Evoque Convertible’s seating provides outstanding comfort and support while featuring a sportier, more technical aesthetic. The door casings reinforce this clean, contemporary feel, with revised contour lines, extra feature stitch lines and reprofiled, more deeply padded armrests for exceptional comfort and visual refinement. Significant chassis bracings support the unique load casings of the convertible model, ensuring comparable torsional rigidity versus the coupé model. This ensures an on-road driving experience and off-road capability closely-matched with the hard top model. Approach, breakover and departure angles of 19.0, 18.9 and 31.0 degrees respectively provide outstanding all-terrain performance. Evoque Convertible can also scale extremely steep 45-degree gradients, safely tilt to an incredible 35 degrees, and wade through water up to 500mm deep. Evoque features a full suite of advanced assistance features including Blind Spot Monitor and Closing Vehicle Sensing, Head-Up Display, Lane Departure Warning, Traffic Sign Recognition, Autonomous Emergency Braking, Lane Keeping Assist and Driver Condition Monitor for maximum convenience and safety. Driver convenience is further demonstrated by the Gesture Tailgate technology. The system provides a hands-free solution for drivers to access the boot space even when they have their hands full. The system is available with keyless entry and parking aid and allows the owner to open and close the tailgate by simply waving their foot underneath the rear bumper of the vehicle. The sensors are located at each corner of the rear bumper to allow operation from the kerb side and in the event that a trailer is being towed. As the customer swipes their foot underneath the bumper, the tailgate opens, making it possible to place any items into the loadspace without having to put them down. Evoque’s capability to tow up to 1,800kg is unaffected. Customers can close the tailgate via either activating the Gesture Tailgate again, the keyfob or a button located on the tailgate. Exclusive to Evoque Convertible, 360 degree Park Distance Controls provide the driver with virtual object tracking along the sides of the vehicle, giving confidence in confined situations, like multi-storey car parks, at speeds up to 16 km/h (10mph). Operational from 5-80km/h (3-50mph), Autonomous Emergency Braking helps the driver to avoid accidents when the vehicle is travelling at speeds below 50km/h (32mph), and greatly reduces the severity of any impacts between 50-80km/h (32-50mph). The system uses the stereo camera mounted next to the rear-view mirror to monitor objects that pose a risk of collision, such as queuing traffic. If a collision is likely, the system will alert the driver with both a visual and audible warning. If no avoiding action is taken, an additional driver warning is triggered while the system applies maximum braking pressure to bring the vehicle to a controlled autonomous stop. Autonomous Emergency Braking is available when Lane Keeping Assist or Lane Departure Warning systems are specified. Making driving more relaxing and safer, Lane Keeping Assist complements Lane Departure Warning, which warns the driver if they are drifting out of their lane. Lane Keeping Assist actively helps the driver to stay in the correct lane by adding any necessary steering correction. Should Lane Keeping Assist sense that the driver is unintentionally changing lanes, it initiates a gentle steering input to return the vehicle to its intended position. Lane Keeping Assist is designed to be completely unobtrusive: it is not active if the indicators are activated, the driver can easily steer against it, and the system can be entirely disengaged if desired. Driver fatigue is a major cause of road accidents. Driver Condition Monitor technology is based on driver steering inputs. Should the technology detect the jerky, non-linear movements typical of driver suffering the symptoms of fatigue, it automatically triggers an audible and visual warning in the instrument cluster. At the heart of the Evoque’s advanced traction and stability systems is a sophisticated electronic control unit which monitors the car at all times, and can individually adjust the braking forces and engine torque applied to each wheel to optimise the handling and help the driver retain control in extreme manoeuvres. The control unit takes into account a wide variety of inputs including individual wheel speeds, cornering yaw rates, longitudinal and lateral acceleration, vehicle speed, gear and clutch engagement, brake pressure, accelerator position and the settings of the Hill Descent Control and Terrain Response systems.